Tuesday April 12th 1921 I got my ironing done by noon and in afternoon fixed the little bed-room to sleep in. Monte was here and Hattie was busy out in the yard. Letters from Mattie Fletcher and Birdie. In the evening Hattie & I went to The M E Church to a concert. The first time I have been in the church since Childrens Day 1918. The sad hours since then. Wednesday April 13th 1921 weather not so pleasant. I was home all day. The girls were both away in afternoon. I was busy. I got Robs supper. Hattie home in evening. I read. A letter from Lydia. 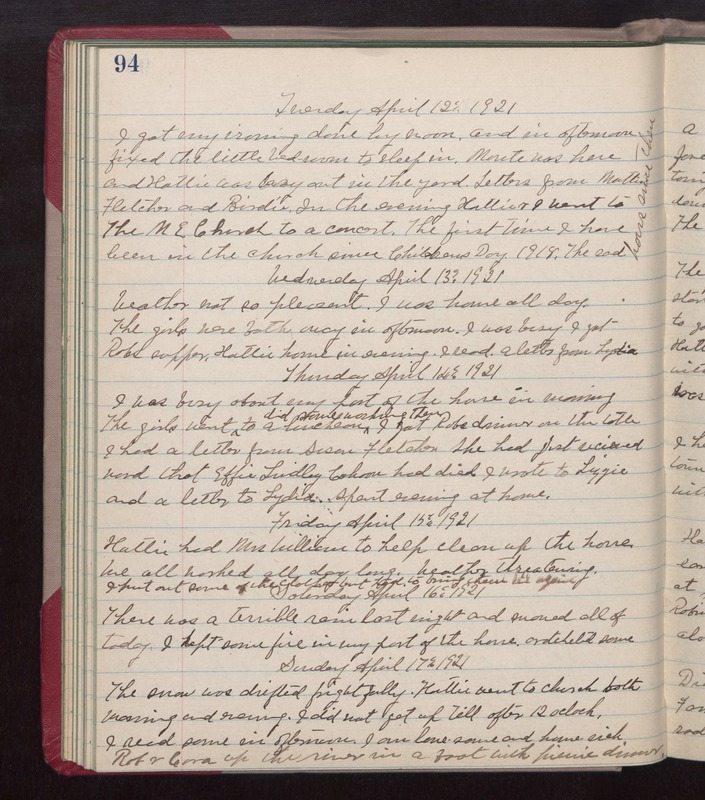 Thursday April 14th 1921 I was busy about my past of the house in morning. The girls did some washing then to a luncheon. I got Robs dinner on the table. I had a letter from Susan Fletcher. She had just received word that Effie Lindley Cohorn had died. I wrote to Lizzie and a letter to Lydia. Spent evening at home. Friday April 15th 1921 Hattie had Mrs William to help clean up the house. We all washed all day long. weather threatening. I put out some of the clothes but had to bring them in again. Saturday April 16th 1921 There was a terrible rain last night and snowed all of today. I kept some fire in my part of the house, crotcheted some. Sunday April 17th 1921 The snow was drifted frightfully. Hattie went to church both morning and evening. I did not get up till after 12 oclock. I read some in afternoon. I am lone-some and homesick. Rob & Cora up the river in a boat with picnic dinner.